The MCW400A100 Multi-Channel Indicator can be connected to as many as four of our MCS100 series air mass flow sensors, providing a centralized display of flow rates. After the measurement flow range of the MCS100 that is on each channel is set, the MCW400A100 displays the instantaneous flow rates and outputs switch signals. 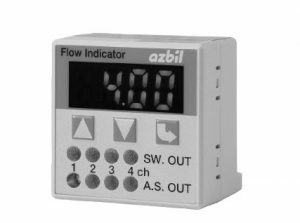 In addition, its four operation modes enable simplified flow rate monitoring (compared to a rotameter) when combined with the MCS100, as well as confirmation of vacuum suction of minute electronic parts.